Foreclosures Archives - Page 3 of 6 - Neighbors at War! 1 Comment on Bieber Bashing! This one is actually kind of funny. Justin Bieber is apparently not well-liked by many of his neighbors. The singing sensation lives in the ritzy neighborhood of Calabasas, California, where homeowners pay $1000 a month in HOA dues. But the teenager’s antics, including loud and late parties, driving like a maniac and threatening other homeowners are causing a neighborhood revolt. Neighbors have repeatedly demanded that HOA officials take some kind of action. Even Sheriff’s deputies are demanding that the D.A. charge Bieber with assault and battery. 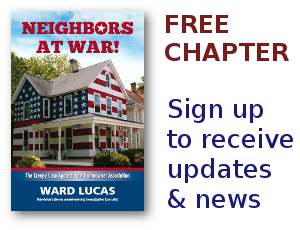 Now, the revolt has escalated to the point that a number of homeowners are refusing to pay their thousand-buck-a-month dues until the HOA takes action. Texas has legislation that prevents HOAs from harassing homeowners over their display of the American flag. But that hasn’t stopped the Forrest Lake Townhouse Association from suing homeowner Billy B. Martin over his flag. Martin says the HOA’s flag at the clubhouse was tattered. The board members wouldn’t do anything about it. So he put up his own. That’s when the HOA started fining him $200 a day. One of the early founders of our movement who’s perhaps one of the top three homeowners rights advocates in the country is Arizona’s George Staropoli. He has testified before legislatures, he’s a devout Constitutionalist, he’s perhaps one of the most articulate people standing up for downtrodden victims of the national HOA scam. To say he was a huge inspiration to me is putting it mildly. His website, pvtgov.org, has tens of thousands of fans. In fact, his was the first site I discovered when I was trying to learn what was wrong with the basic nature and structure of American Homeowners Associations. Oh, we just seem to love it when we can celebrate the crash and fall of celebrities. I’ve never really understood that. When I come across a celebrity-bashing during my web browsing, I generally skip over it without looking. But I did click on the link below while googling celebrities and Homeowners Associations. Seems that rythm and blues star, Chris Brown, has tried to express himself with graffiti on the exterior of his home. His Hollywood neighbors don’t like it. 1 Comment on Enter the Bulldozer! Neighbor disputes get incredibly nasty. But when one of the parties in a dispute is a bulldozer owner who’s a little mentally unbalanced, that’s when things get really bizarre. I don’t know the background of this dispute. But a Port Angeles, Washington homeowner was so furious with neighbors that he used a bulldozer to raze their homes. It’s not the first time a bulldozer has been used to settle a neighbor dispute, either. The last time this happened was in Granby, Colorado in 2006. Linked below are the stories on the Port Angeles, Washington bulldozer. The second linked is the 2006 Colorado bulldozer.